It's the Four States Furniture – Furniture Facelift! You can WIN $10,000 of brand new furniture, and give your home a summer makeover! Get to any of our friends below and register now! Then, listen for your name weekdays at 7:35 & 8:35 in the mornings, and 4:35 & 5:35 in the afternoons. Call us back within 10 minutes to instantly qualify! ‘LIPPIAN FAMILY DENTISTRY’ - WHERE YOUR FAMILY GETS GENTLE AND CARING DENTISTRY. Register now and listen for your name weekdays at 7:35a, 8:35a, 4:35p, & 5:35p. Call us back within 10 minutes to instantly qualify! 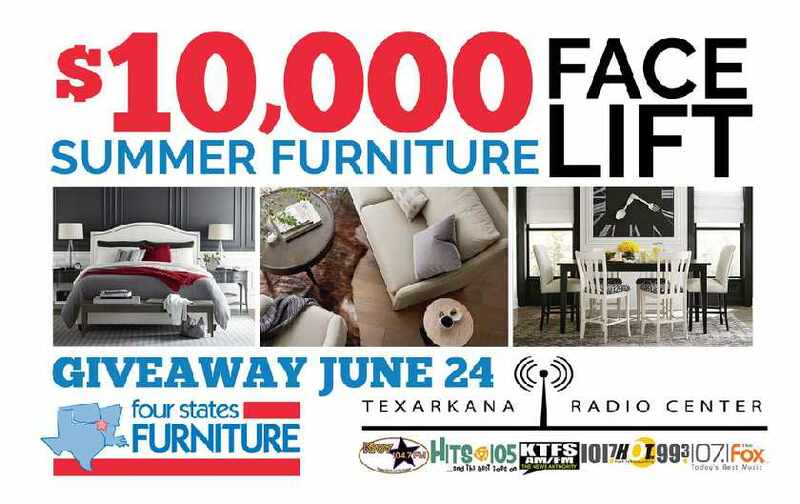 You could WIN the $10,000 Furniture Facelift - from Four State's Furniture! 2. PROMOTION PERIOD: Promotion period begins on March 2017 and ends on June 23, 2017. All Entries must be received no later than June 23, 2017. 3. ENTRY: Listeners register at participating sponsors’ locations then listen for their name to be announced on 104.7 KTOY, HITS 105, 107.1 THE FOX, 101.7 HOT FM, 98.7 KTFS . One entry per person. Qualifying contestants have a qualifying letter generated by Texarkana Radio Center available for pickup from the studios at 615 Olive Street, Texarkana Texas 75501 on or before 6/23/2017 by the close of the business day. This letter will be needed to register for the final event. Listeners who qualify after 6/23/2017 may pick up their letter at the final event at Central Mall. Qualifiers must present their qualification letter and government issued photo ID to station representatives at the registration table during the final event on 6/24/2017 no later than 1:30 PM. Station representatives will have sole discretion to allow qualifier into the final registration. 4. PARTICIPATION AND WINNING: When their name is announced contestants will have 10 minutes to call the announced telephone number and qualify. Contestants that call within the allotted time will move on to the final event on 6/24/2017 at Central Mall. The call-in time and requirement may be waived. Such waivers will be announced when applicable. Qualifiers will be eligible for the grand prize. In addition to our on air qualifiers, qualifiers may be chosen from listeners entering at the final event on 6/24/2017. Qualifiers must be present at the drawing at Central Mall on 6/24/2017 to win. Around 1:45PM a station representative will draw a name from all registered qualifiers. The name will be announced at least 3 times. If there is no response within approximately 30 seconds of the name being announced, the name will be discarded and a new name drawn..
5. PRIZE/ODDS/LIMITS ON PRIZES AVAILABLE: (1) Grand Prize: $10,000 Summer Furniture Face Lift from Four States Furniture. The odds of being chosen as a contestant are dependent upon the number of entries received. Prize is not transferable and may not be given, bartered, sold, or exchanged for another prize. All taxes on any prize awarded are the sole responsibility of the winner. 10. WINNERS LIST: For the name of the winners, if any, send a self-addressed first class stamped envelope to: Texarkana Radio Center, 615 Olive Street, Texarkana, Texas 75501 for receipt by 6/23/2017.